It is rare to hear the words “scarlet fever” in today’s modern world of medicine, but the illness is still in existence and may lead to serious complications if left untreated. What was once a widespread childhood disease has become a less common condition, thanks in part to antibiotics and prevention tactics. Seeing your child suffer with a reddish-pink rash, fever, and severe sore throat can send any parent into panic mode. These key scarlet fever symptoms can also be seen in other conditions, and lead to much confusion. So, what is scarlet fever? Is scarlet fever contagious? We will answer these questions and more as we take a closer look at this disease, sometimes referred to as scarlatina. Scarlet fever is an infection of the bacteria group A streptococci. It often develops in those with the illness known as strep throat. The puzzling aspect of this condition is that not all cases of strep throat result in scarlet fever, although the same bacterial infection causes both ailments. It can also be seen in patients with a streptococcal skin infection from a wound injury or burn. The rough, sandpaper-like rash can appear anywhere on the body, and is accompanied by a high fever and sore throat. Scarlet fever is seen in children ranging from five to 12 years of age, with far less cases reported of scarlet fever in adults. Is scarlet fever contagious? Yes, scarlet fever can be contagious if you come into contact with a person with the group A streptococcal bacteria. On the other hand, not everyone who contracts the bacterial strain develops scarlet fever. Also, if you do have scarlet fever, you can carry the contagious strain for several weeks after the symptoms disappear without treatment. How Is Scarlet Fever (Scarlatina) Transmitted? How is scarlet fever transmitted? The disease can easily be spread through the fluid droplets from the infected person. This is how the bacteria that causes scarlet fever can be spread throughout families, schools and workplaces. We have outlined the direct and indirect ways these droplets can be transmitted from person to person. Scarlet fever causes are linked to the group A streptococcal bacteria strain. The mystery remains as to why the common strep throat illness is prevalent when the same strain is responsible for the rarer scarlet fever disease. With scarlet fever, the infection is a toxin that causes the redness of the throat and tongue as well as the rough rash. The complications of scarlet fever can be serious and life-threatening in some cases. It is important to recognize the symptoms of swollen glands, a sore throat, a red rash, and a fever higher than 102° Fahrenheit. It is especially crucial to get your child to a doctor if you know they have come into contact with anyone with strep throat or scarlet fever. If left untreated, scarlet fever can cause ear infection, pneumonia, kidney inflammation, meningitis, and endocarditis, an infection of the lining of the heart. If the young patient has Tourette syndrome, attention deficit hyperactivity disorder, or obsessive-compulsive disorder, the same bacterial strain can trigger symptoms of these conditions. A scarlet fever diagnosis will rule out any possibility that the symptoms are caused by another health condition. A physical examination will have the doctor check the tongue, throat, and tonsils. He or she will also feel the neck for enlarged and tender glands and examine any rash. A throat swab will be taken from the back of the throat and tonsils to be sent for laboratory testing for the disease. The presence of strep bacteria will confirm the diagnosis. Wash hands with soap and warm water throughout the day. Refrain from contact with an infected person. Avoid sharing toothbrush, utensils, drinks, and food with others. Practice proper food handling when cooking. Get required vaccinations when traveling to other countries. Scarlet fever was once a pervasive and deadly disease in children, and today is still a concern for some, even with the development of antibiotics. It is caused by the same bacterial strain, group A streptococci, that causes strep throat; however, not all cases of strep throat develop into scarlet fever. The reason behind this is not known. Scarlet fever has distinct features, yet some symptoms mimic those found with other health conditions. The infection of scarlet fever can lead to serious conditions if left untreated. You can protect yourself and your family from this contagious disease by taking the same precautions you practice against other infections. 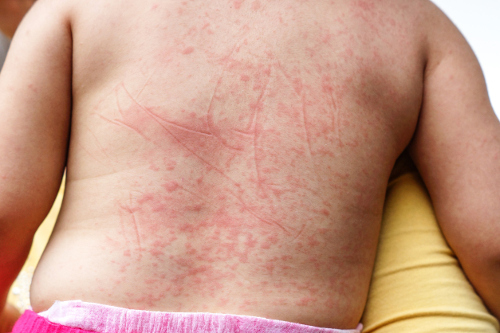 Johnson, S., “Scarlet Fever,” Healthline, August 7, 2012; http://www.healthline.com/health/scarlet-fever#overview1, last accessed July 14, 2017. Nordqvist, C., “Scarlet Fever: Causes, Symptoms, And Treatments”, Medical News Today, June 26, 2017; http://www.medicalnewstoday.com/articles/176242.php, last accessed July 14, 2017. Davis, C.,“Is Scarlet Fever Contagious?” Medicine Net; http://www.medicinenet.com/is_scarlet_fever_contagious/page2.htm#when_should_i_contact_a_physician_about_scarlet_fever, last accessed July 14, 2017. ‘What Is Scarlet Fever?” WebMD; http://www.webmd.com/a-to-z-guides/understanding-scarlet-fever-basics, last accessed July 14, 2017. “Scarlet Fever,” Mayo Clinic; http://www.mayoclinic.org/diseases-conditions/scarlet-fever/basics/definition/con-20030976, last accessed July 14, 2017.